An aerial view shows the planned AEP Ohio Pomeroy Service Center which is under construction along State Route 7 near Eastern High School. REEDSVILLE — Ground work is taking place on what will become American Electric Power Ohio’s new Pomeroy Service Center. The new state-of-the-art center is being built in what was an open field across from Eastern Elementary/High School. Currently, the Pomeroy Service Center operates out of a facility leased from the Meigs County Community Improvement Corporation (CIC) approximately 6 miles south of the new site. The new facility will serve as a regional service center, providing service to Athens, Gallia and Meigs counties. “This new service center will allow us to better serve our customers in southeast Ohio. Our current space has served us well for many years, but this new facility will give our crews easier access to the equipment they need to maintain and repair the electric grid,” according to a media relations representative for AEP Ohio. Forty-eight employees will occupy the new facility, which when complete, will include six truck bays and four acres of outdoor storage space. The Pomeroy Service center serves 19,000 customers and 1,000 line miles. “We are thrilled and grateful that AEP has not only decided to stay in the county, but make this tremendous investment and expansion,” said Meigs County Commissioner Randy Smith on behalf the commissioners. Meigs County Economic Development Director Perry Varnadoe explained that the planning for the potential project has been taking place for about two years with AEP Ohio looking at sites around the area. “It could have gone anywhere but they chose here,” said Varnadoe. The Economic Development office, Community Improvement Corporation and the Commissioners had worked with AEP Ohio to identify potential locations in the area with AEP Ohio ultimately selecting the location in the eastern portion of Meigs County after looking at multiple sites. Varnadoe estimated that the project was around an $8 million investment by the company in the area. 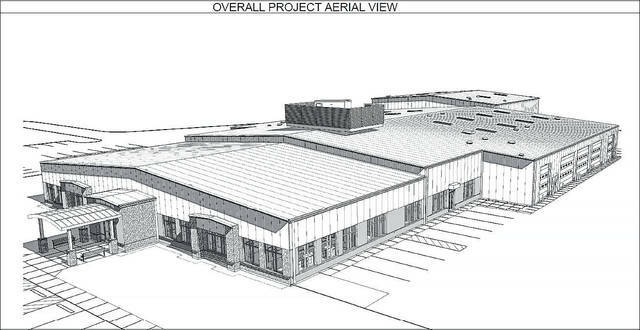 AEP Ohio expects to be in the new facility in the fall of 2018.
https://www.mydailytribune.com/wp-content/uploads/sites/42/2017/10/web1_Pomeroy_OverallProjectAerialView2017101311304444.jpgAn aerial view shows the planned AEP Ohio Pomeroy Service Center which is under construction along State Route 7 near Eastern High School.